In this week’s blog post, we will be informing you about the natural beauties, historical aspects, and the enjoyable activities that take place around Fethiye. We have picked three locations, which are unforgettable in their unique ways. We will be informing you about the history and the artistic beauty of Amyntas King Tomb and Rock Tombs. Secondly, we will be writing about the Fish Market for those who like eating by the side of a brilliant view. The last location is Çalış Beach, at which you can participate in many different activities, or just lay down at the sandy beach to relax. As a travel agency at Fethiye, we wish you fun, and relaxing holiday. During the history, our ancestors created amazing works of art in many different forms. Lycian Rock Tombs are a perfect example of those works of art. 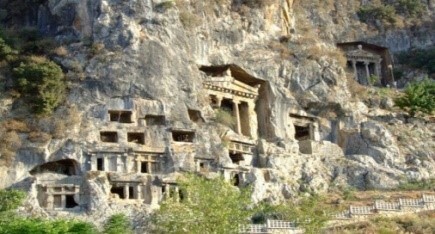 Lycian people constructed the Rock Tombs to pay respect and honor the memory of their loved ones a after the loss them. After all these years, remains of the Rock Tombs had become an important part of Anatolian history. Remarkable Lycian Tombs are located in the city center, being a part of the daily life; and not in the outer parts of the town. As a Travel Agency in Fethiye, we respect to those who helped maintain the Rock Tombs during centuries. Thanks to them, current generation and the future generations can enjoy the wonders of our history. Fethiye’s most recognisable sight, the mammoth Tomb of Amyntas, an Ionic Temple facade carved into a sheer rock face in 350 BC, in honour of 'Amyntas son of Hermapias’. Located south of the city center, it is best visited at sunset. Other, smaller rock tombs lie about 500m to the east. In our picturesque sea-side town, Fethiye Fish Market would be an unforgettable memory for those who love eating sea-food, by the side of the calm, blue sea. The vendors at Fethiye Fish Market sell seasonal, locally caught fish and imported fish every day of the week. The main stall sited in the center of the market hosts a range of independent fish mongers who have their fish on display and priced. Visitors to the market can even buy fish from the sellers and have it cooked in one of the nearby restaurants for a small fee. Çalış, also known as "Çalış Beach" is located at the west entrance of Fethiye. It is 7 kilometers away from Fethiye city center. 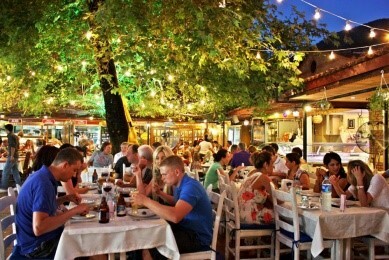 Çalış is one of the most popular touristic area of Fethiye. With its 4 km long sandy, warm beach, Çalış gets more and more visitors each year. Beach side is full of nice restaurants, pubs, bars and hotels. The small street with local shops becomes colorful in summer nights. 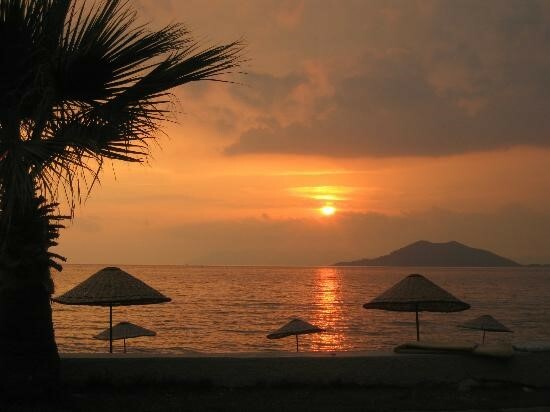 Çalış Beach is the best place to watch the sunset in Fethiye. The view of the Sun setting over the islands is marvelous. It has its own atmosphere. Beside regular minibuses which go to Fethiye City Center, there are Water Taxis which are small motor boats that take its passengers to Fethiye City Center. Surrounding area of Çalış Beach is a natural beauty. There is a small natural park full of different kinds of birds called “Bird Heaven”. If you are lucky enough, you can observe the Caretta Caretta turtles moving around at Çalış Beach. Every year, Caretta Carettas visit the Çalış Beach to lay their eggs into the sandy beach. In the right date you may have chance to see the offspring or the adult turtles on the beach. Çalış is also known for the wind surfing. Area has a nice breeze which keeps you cool in hot summer days and nights. That breeze also makes the area one of the popular b>windsurfing and kiting places of Fethiye. There is a school for windsurfing and kiting to make your holiday even more joyful. Keep following our weekly updated blog to learn more about the natural wonders, historical values, and touristic areas of Fethiye. 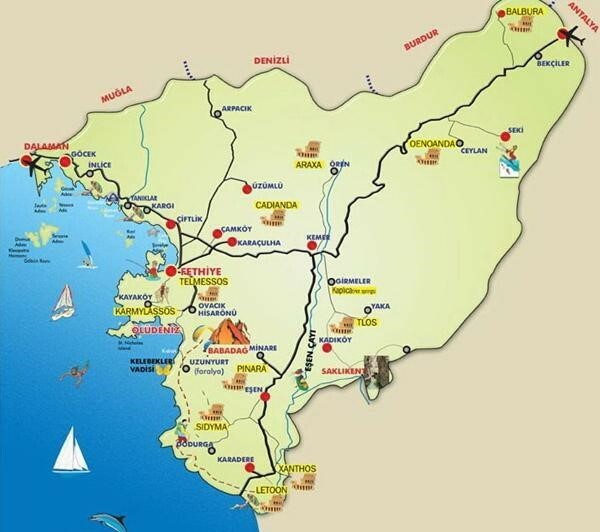 For a more comfortable holiday be sure to visit our website and check our services such as Rent A Car, airport transfer services to/from Dalaman Airport transfers to/from Fethiye, Calis, Oludeniz, Ovacik, Hisaronu, Gocek, Marmaris and to/fromAntalya Airport transfers to/from Fethiye, Calis, Oludeniz, Ovacik, Hisaronu, Gocek, Marmaris. Also check our tours and unforgettable activities such as Paragliding, Diving, Horse Riding etc. at Fethiye.